BARBERINO VAL D’ELSA, TUSCANY— The older I get the more I search for authenticity. Often, I find myself attracted to things, places, and experiences that are “real.” So often when people travel overseas they, by no fault of their own, wind up in the EPCOT version of a European town or restaurant. I always strive to find the places where no tourists go, eat in the places that no tourists eat, and meet the people that no tourists meet. It is not until then that one can take in the true measure of a place and its people. That is what originally brought me to this area. The sister towns of Barberino Val d’Elsa and Tavarnelle Val di Pesa are far off the beaten track. 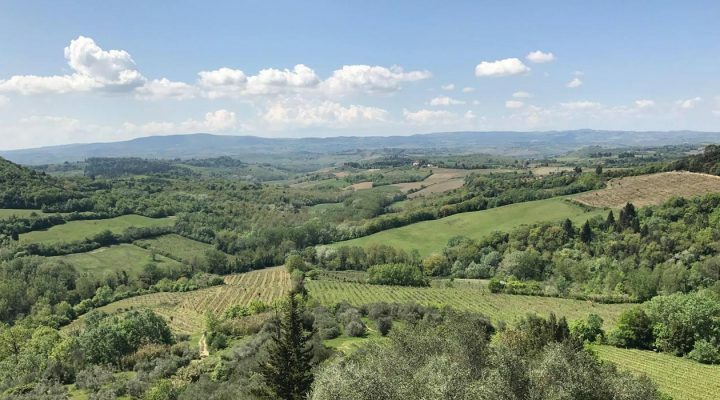 Barberino might get a few tourists who wind up inside its medieval walls, but Tavarnelle is filled with only locals, and the occasional couple who might be taking a bike tour through the Chianti region and took a wrong turn at Poggabonsi. This is the place that made me fall in love with Italy, especially Tuscany. 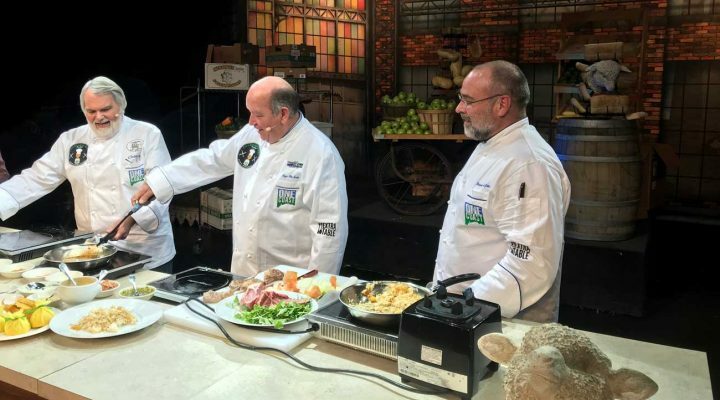 This region is, in many ways, like the American South— it is an agrarian society, the food is great, people enjoy each other’s company, and they are caring, friendly, and giving. All those factors came together in one memorable Easter lunch yesterday. Our friend Annagloria invited our family, and the two friends traveling with us, to her family’s Easter lunch. It was authentic, it was real, and it was a blast. After a morning breakfast at our favorite bakery, and a visit to a packed Easter mass in the small medieval cathedral in Barberino, we rounded up the troops and our six joined Annagloria’s 25. It was a meal straight out of central casting for an Easter family lunch in Tuscany. A table of 24 and a table of seven in one room with five generations of Tuscans, friends, family, kids of all ages, distant relatives, surrogate aunts, longtime family friends, and the St. John crew from Mississippi. The Tuscans couldn’t have been more welcoming. The meal was served in the traditional Italian order of antipasto, a first course pasta, a second meat course with side dishes, a salad course, a cheese course, dessert, coffee, and a digestivo. It was all served family style on the two large dining tables. We started with a baked bruschetta with stracchino cheese and local sausage, crostini with a black-cabbage leaf pesto made with almonds and walnuts and extra virgin olive oil that came from olive trees about 15 feet from the dining room, and Annagloria’s homemade liver pate. Then she served three very light and subtle lasagnas— one with tomato sauce, one with a leek cream, and the other with artichokes. The meat course included sliced roast beef that was somehow cooked in milk, which sounds a little strange, but it was some of the most tender roast beef I have eaten, and pork scamerita which was roasted low and slow with herbs and white wine. She forgot to serve the caponata, but I’ve had Annagloria’s caponata before. It is excellent and I included it in the cookbook An Italian Palate (and with this column). You should make it tonight. Trust me. The side items that accompanied the meat were spinach with garlic (I don’t know what it is about the spinach over here, because it’s just cooked in extra virgin olive oil and garlic, but it is always impressive), and fresh English peas. A tossed salad was passed around, but it never made it to me so I helped myself to thirds on spinach. The conversation was lively and spirited. Annagloria’s three children Gemma, Bianca, and Pietro were up and down through the entire meal helping their mother serve lunch. 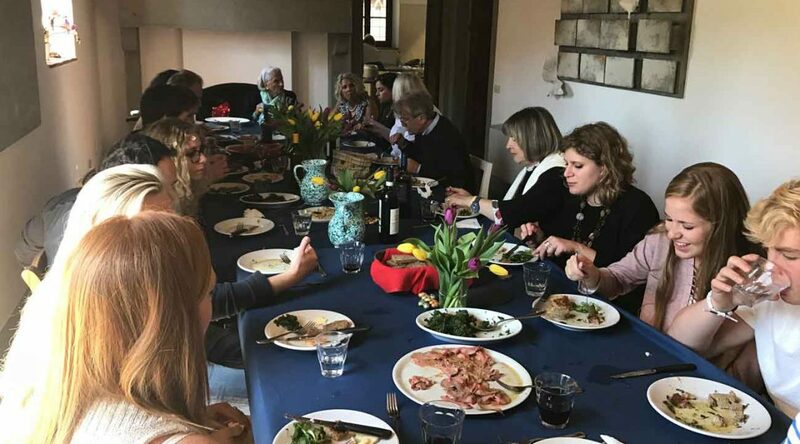 It was as one would imagine an Italian Easter lunch— trays and plates being passed, wine being poured, and everyone talking at once in an enthusiasm that only reaches its peak when food is involved. I was flanked by my friend Enzo, the patriarch of the clan (though he will admit that Annagloria is the boss), and a longtime friend of the family who is considered a surrogate aunt. I picked up two cakes at the bakery that morning, and as they were being passed, Annagloria brought out her famous flourless chocolate cake with whipped cream. Annagloria’s son, Pietro, took orders for coffee, and later poured limoncello for those who hadn’t had enough wine. Being a teetotaler, I finished off three pitchers of water during the meal. As I watched my children talk to a man who teaches at one of the high schools in Florence, I looked around the room, grabbed my wife’s hand under the table, squeezed it three times, and counted my blessings on an Easter Day that I know I will remember as long as I am able to remember. I love the museums, the food, the culture, and the scenery— it’s what keeps me coming back to this part of the world. Though what I am most grateful for are the friendships we have made in Italy. They are real, they are genuine, and they are authentic. It’s just as I have always said of Mississippi— it’s the people. When you peel all the shiny things back, and a place is raw and left bare, it’s the care, concern, passion, and enthusiasm of the people that make or break a place. Tuscany has it in spades.